I’m sure you’ve heard some benefits to cooking with coconut oil, but do you know the benefits coconut water has for your inner and outer beauty? Keep reading to learn these 6 benefits! The only time many people get a chance to drink fresh coconut water is while on vacation, if you’re lucky enough to live in a tropical climate, bountiful with coconuts, then you must make drinking a coconut a day part of your morning ritual! Skin can look dry and dull through sun damage, old age and improper care for skin. Drink one coconut a day and use coconut as a skin toner. Get a cotton ball and add coconut water, massage into skin and let dry. Coconut water is rich in many vitamins that help your skin retain elasticity. Nicknamed “Nature’s Gatorade” by many sports athletes because coconuts are low in calories, naturally fat- and cholesterol free, more potassium than four bananas, and super hydrating. It is naturally isotonic and contains electrolytes, calcium, phosphorus and potassium all in their raw and natural form. 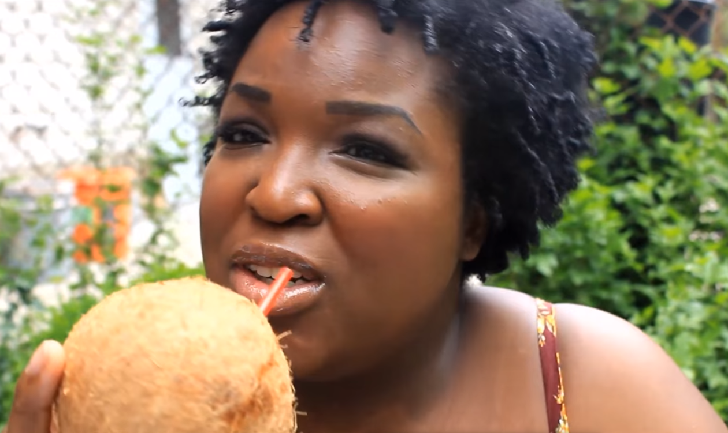 Coconut water goes a long way for people suffering from acne. It naturally eliminates excess oil on the skin and balances skin pH. This is why you may find many shampoos, conditioners, and facials containing traces of coconut. Because coconut water contains many electrolytes, drinking this water the morning after a long night out will help you regain those electrolytes lost from vomiting and urination. Sure you drink the coconut water, but are you eating the meat? Don’t waste your coconut! Yes, coconuts have a high-fat content, and yes they are saturated fat…but they are made from medium-chain fatty acids, unlike other high saturated fat foods which contain long-chain fatty acids. This means that coconut meat is an easier fat to break down in the body and according to “The Philippine Journal of Cardiology”, the fat in coconuts may actually help lower bad cholesterol levels and increase good cholesterol. Coconut oil contains vitamin E. This vitamin is essential to healthy skin, it helps fight natural wear & tear to the skin, helps smooth skin and accounts for a flawless appearance. 100g of oil has about 0.1 mg of vitamin E, therefore you should use this oil daily especially if you have a tendency to develop stretch marks and skin pigmentation. I hope these 6 benefits of coconut water, oil and meat have helped you understand the importance of this fruitful fibrous one-seeded drupe. Next time be sure to drink one coconut a day for a year’s worth of health!